There is Power and Purpose in Play! A belief in the essential importance of PLAY in our lives is something I have known for some time – perhaps all of my life. I certainly played as a child. Whether it was an evening filled with Hide and Seek and kids of a variety of ages in our St. Paul neighborhood; or a week spent with jacks, roller skates, four square, jump ropes and tea parties on my neighbor’s driveway with her granddaughter; I have very specific and warm memories of hours spent in play. Every summer featured plays – some made up and others from a script – put together on the porch and performed in the basement rec room by me, my sister and a few neighbors. We sometimes charged as much as a nickel to attend what I am certain was a lively musical performance about leprechauns or princesses. I participated in plays and programs at every opportunity. I obviously have never been afraid to stand up in from of an audience. In school, I always tried out for plays and skits of any variety. I did not always get the part I wanted, but I always was given some role that kept me engaged. My single claim to fame at Highland Park Senior High School was the lead in My Fair Lady. Yes, I was Eliza Doolittle – not because I was the “best” singer, but because I had the best cockney accent! I can still remember most of the lines and songs, making me a potentially annoying audience member if I attend a performance somewhere. In my life as a kindergarten teacher, the curriculum I taught was entitled Playways. My college professor, Dr. Harlan Hanson was the co-creator of the curriculum. It was built on the knowledge that play is a child’s work and the best way for them to explore and learn about the world is through play. It makes me sad, that play is being unilaterally removed from most of public education, construed as a “waste of valuable teaching time.” I will go out on a limb here and say: Nothing could be further from the truth and more hazardous to the future of our culture and civilization than that opinion! Play is essential to life and learning. What are our children learning if there is no choice to explore their innate curiosity about their world and the people in it? What are we as adults, parents and grandparents doing to supplement that lack of play in formal education with play opportunities elsewhere? This past weekend I attended the annual conference of the Association for Applied and Therapeutic Humor in Orlando, Florida. 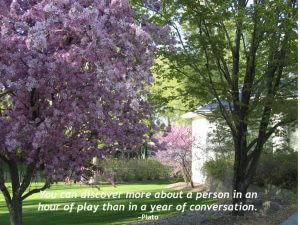 The conference theme was “The Power & Purpose of Play.” It was a powerful and purposeful experience. Those in attendance are humor and laughter professionals and enthusiasts, from a wide variety of occupations, missions and avocations; who understand the important of incorporating laughter and humor into life – their own and those with whom they experience life’s journey. According to the website: “Therapeutic humor is any intervention that promotes health and wellness by stimulating a playful discovery, expression or appreciation of the absurdity or incongruity of life’s situations. This intervention may enhance health or be used as a complementary treatment of illness to facilitate healing or coping, whether physical, emotional, cognitive, social or spiritual.” Officially adopted by the AATH Board of Directors on June 1, 2000. Not that I needed reminding, but I was reminded by everyone attending, along with each and every presenter/speaker, that play is essential to our nature and a keenly valuable resource for navigating the narrow spots of life. We even had a night of “RECESS” complete with marbles, jacks, hopscotch, kick ball, four square, hoola hoops and jumping rope to demonstrate how joyful the freedom to choose to participate in play activities can be. (Serendipitously, all activities were one-hand friendly!) There was always a place for participation as a cheerleader, if that was your choice. The spirit and the laughter in the room was palpable! We had a “Rock, Scissors, Paper championship, where everyone started out as a competitor and then became part of the cheer squad for the victor until there were only two competitors left – with a hundred cheerleaders each. With great anticipation, the final match was held and the “champion” was boisterously cheered by everyone in the room. It was a fast-paced, exciting, non-threatening, 5 minutes of activity for a room full of adults – all of whom were enthusiastically willing and eager to play. What this organization and those attending the conference did was to reinforce and enhance what I know to be true: We ALL need to look at our lives today as well as in our childhood to rediscover the essence of the play activities in our history, and hold their essence as a resource for resiliently responding to whatever life brings our way. Play is not only for children. And we would do well to ensure that play is part of everyone’s life – young and old.